Swaraj Abhiyan leaders Prashant Bhushan and Yogendra Yadav on Tuesday accused CBI Special Director Rakesh Asthana of accepting large sums of money from controversial company Sterling Biotech, booked by CBI for bribing Income Tax officials and Rs.5000 crores bank fraud. 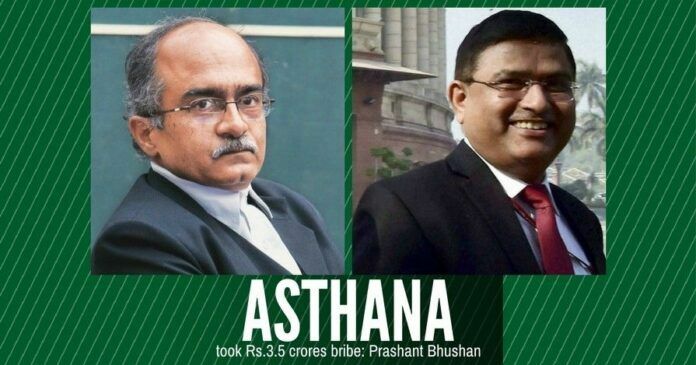 Producing certain portions of the bribe payout dairies seized from the company in the press conference here, Bhushan and Yadav said the diary entries expose that Asthana took around Rs.3.5 crores from the Sterling Biotech. Bhushan also said in many cases Modi Government is not at all acting and claims on anti-corruptions were just fake. “The Government must rollback retrograde changes in political funding laws, instead make new laws to check black money,” said the Swaraj Abhiyan leaders. In the press conference, the leaders said the Government’s decision to celebrate ‘Anti-Black Money Day’ is just a joke, citing many cases of black money trail by corporate, including the recently leaked ‘Paradise Papers’. Bhushan alleged that Asthana was Police Commissioner in Surat in 2011, when he regularly accepted pecuniary favors from the Gujarat based Sterling Biotech and Sandesara Group of companies. Blaming the government for promoting Asthana as Special Director in CBI, Bhushan pointed out that his tenure in CBI is untenable, when the agency has registered two First Information Reports (FIR)s against the company. The first FIR was registered against many senior Income Tax officers whose name was in the bribe payout Diaries, where Asthana’s name was also involved. Prashant Bhushan had already filed a Public Interest Litigation (PIL) against the “illegal” promotion of Asthana. “This is specially so because the Additional Director (Asthana) works under the CBI Director and the latter is in the best position to judge the merits and suitability of the proposed appointee. The opinion of the CBI Director, therefore, ought to have been given the highest regard and should not have been overruled without sufficient reason,” said the petition seeking the cancellation of the promotion order. In the press conference Bhushan and Yadav alleged that Modi Government is not at all taking any action in the black money cases involving Mukesh Ambani, Anil Ambani, Adani Group and Essar Group’s Ruia brothers. Previous articleIs Omar misleading Indians through arrogance or ignorance? Next articleManmohan Singh – then reticent, now virulent? 2.This present “disclosure” did not find any takers in the main stream media. Even RG, waiting for ever an opportunity to hit Modi did not bother about it. 3. This officer worked in Gujarat during the time Modi was the CM and Amit Shah was the home minister under whom the department of police comes. So they must be knowing the background of this officer. Asthana seems to be playing around with Modi and Ahmed Patel like corrupt typical Gujarat cadre officers. Pretend as BJP supporter in BJP and play with Congress in Centre till 2014. Time to shunt him.